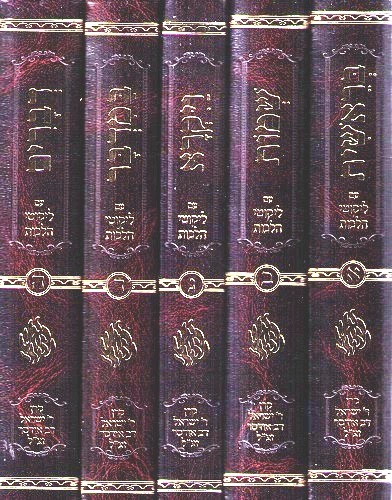 Author (Likkutei Halakhos): Reb Noson Description: A ground-breaking new project which combines an excellent text of the standard Chumash and Targum Onkelos, Rashi, Ikkar Sifsei Chakhomim, and Baal HaTurim, with selections from Reb Noson's masterwork, Likkutei Halakhos, as related to the weekly sedra.This edition is medium size,lightweight and compact,and ideal for traveling.Although small it is beautifully typeset and extremely legible. 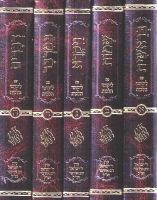 Publishing Data: Keren Rabbi Yisrael Odesser, Jerusalem; 6" x 9", HB, with nekudos; Bereishis 495 pp. ; Shemos 506 pp. ; Vayikra 337 pp. ; Bamidbar 448 pp. ; Devarim 510 pp.